Dan and Debbie’s gift baskets are filled with quality Iowa-made products, including our farm-fresh dairy. These local baskets make a special and unique Mother’s Day gift. Also available are e-Gift Cards to our Creamery store in Ely. 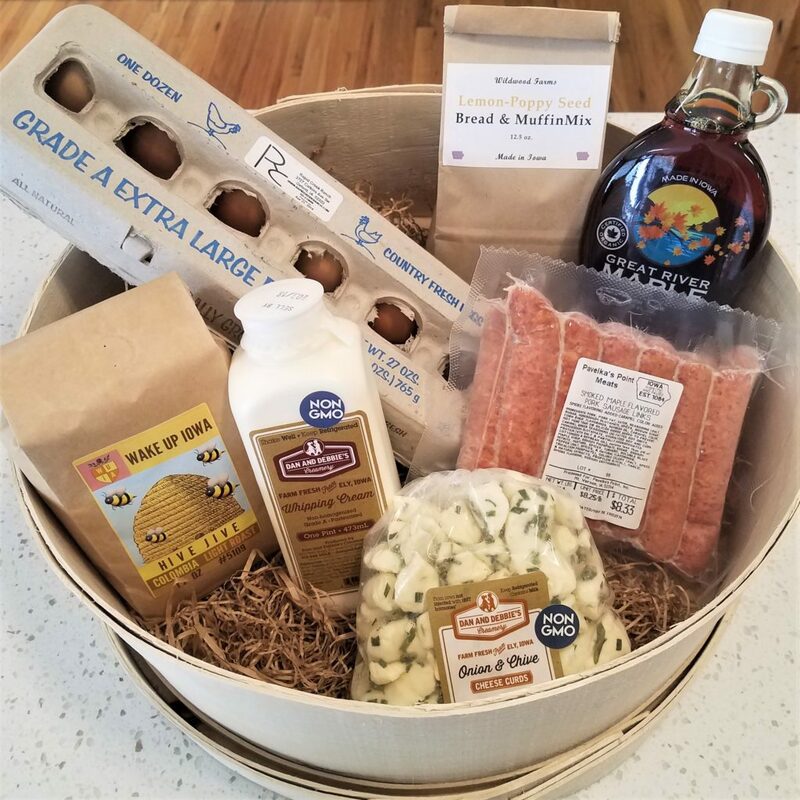 The Ultimate “Moo-ther’s” Day basket includes all of the best Iowa-made products to treat the person in your life who deserves it most. 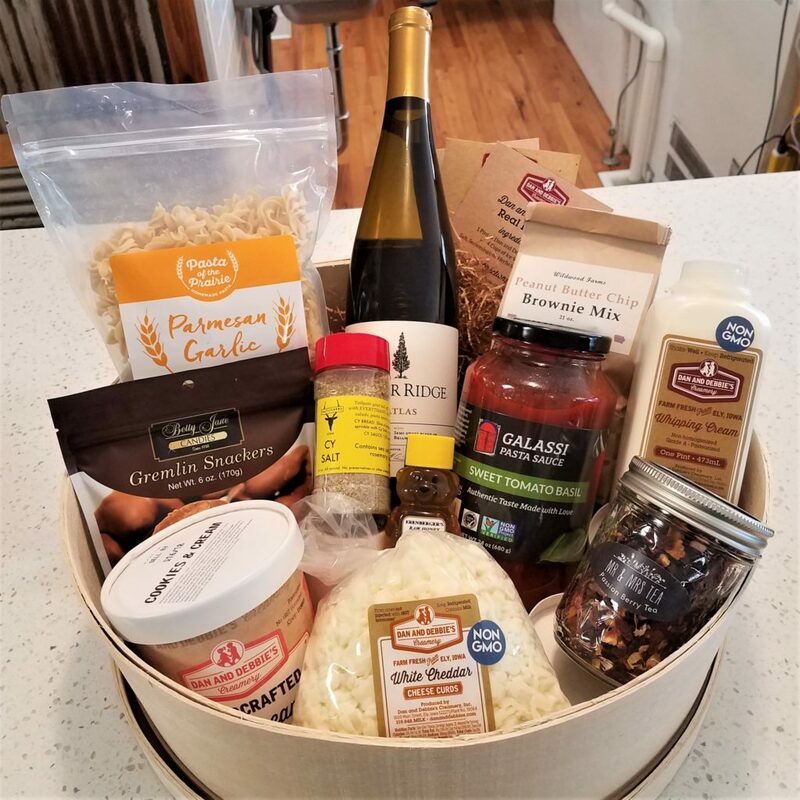 It includes everything you need to make a 100% local dinner for mom that tastes gourmet: Cedar Ridge Winery and Distillery’s best-selling bottle, Pasta of the Prairie Fusilli, Galassi Pasta Sauce, Saltlicker’s fresh seasoning salt, and Dan and Debbie’s fine cheese toppers. For dessert, Wildwood Farms Brownie Mix and a pint of Dan and Debbie’s handcrafted ice cream. The basket also contains loose-leaf tea and a mini Erenberger honey bear and recipe cards. Treat mom with a breakfast in bed made with local ingredients: Wildwood Farms Pancake Mix, Great River Maple Syrup, Rapid Creek Ranch free-range eggs, Pavelka’s Point bacon OR maple sausage links, Dan and Debbie’s Onion and Chive Cheese Curds, Wake Up Iowa Coffee, Dan and Debbie’s Whipping Cream, and recipe cards. 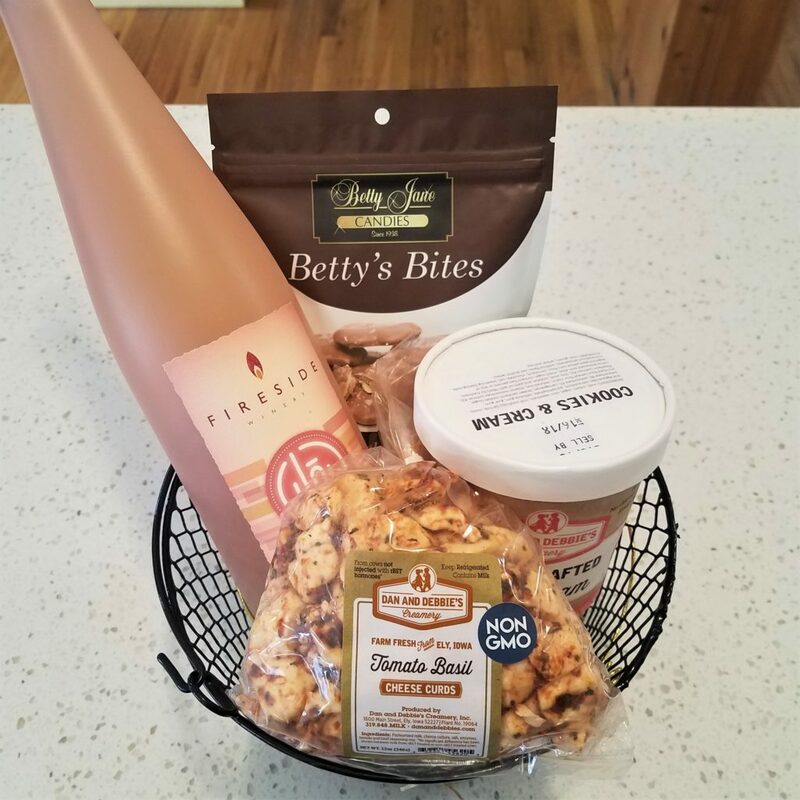 Treat mom with these mother’s day staples: best-selling wine from local Fireside Winery, a pint of Dan and Debbie’s handcrafted ice cream, Dan and Debbie’s Cheese Curds, and Betty Jane Chocolates. A quick way to get on Mom’s nice list! Let mom relax with a warm mug of local tea. 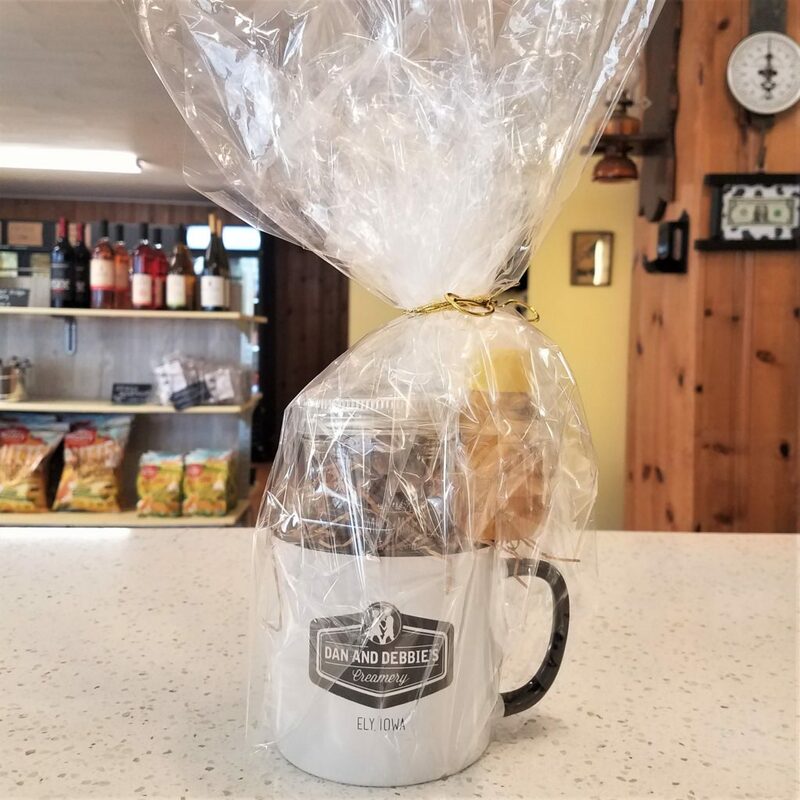 This basket includes a Dan and Debbie’s signature ceramic mug, your choice of Mr. and Mrs. loose-leaf tea, and a mini Erenberger honey bear. 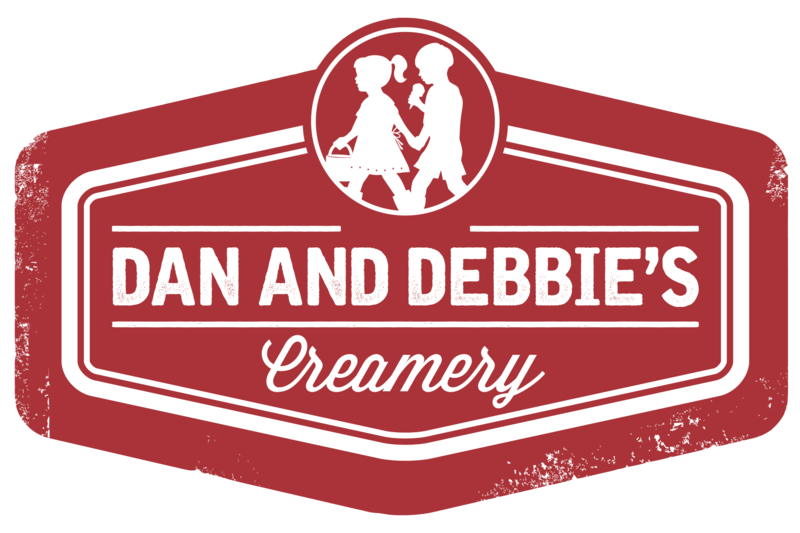 Submit your gift basket order form to Dan and Debbie’s Creamery located at 1600 Main St. in Ely, Iowa. You may also email your completed order form with payment information to our team member Bridgette at bridgette.banda1@gmail.com or call us at (319) 848-6455 during our creamery store business hours. Thank you for shopping local and supporting your local dairy farmer!